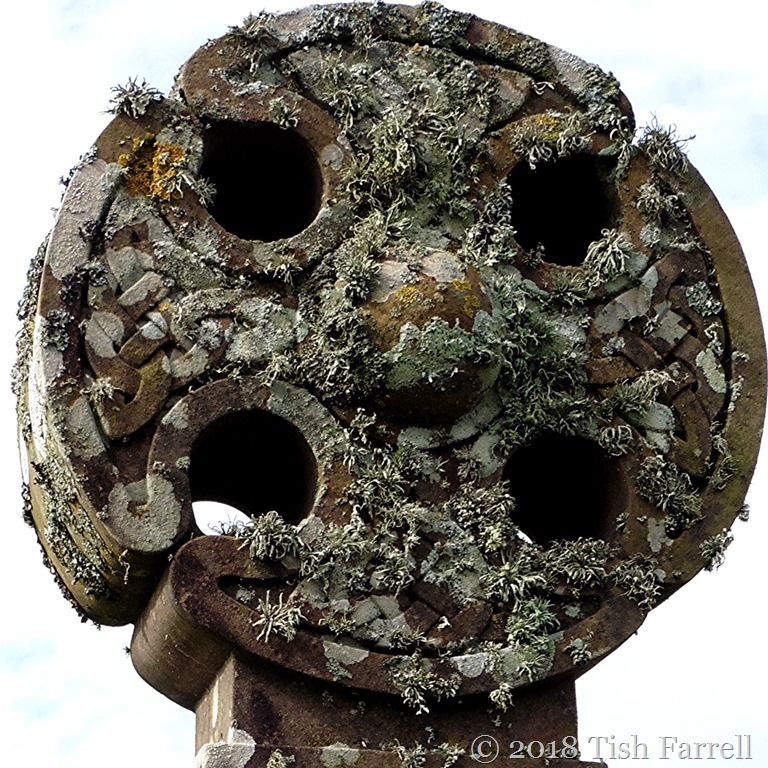 Posted on March 22, 2018 March 26, 2018 by Tish Farrell	This entry was posted in Environment, memoir and tagged #CaringForGodsAcre, #MarchSquare, #SixGoPottyInPembroke, biodiversity, botanizing, lichen, Tish Farrell Writer. Bookmark the permalink. Good job on Squaring the circle.I too like graveyards. They are very interesting places to wonder around. Very interesting post on the importance of graveyards in the UK for wildlife and nature in general. Your story of your father added extra spice to the story. New for me was that the presence of lichen is an indication of clean air. Thank you, Tish! Glad you liked this, Peter. Thank you. Yes, sometimes quite astonishing things to see. One that was truly amazing is the cemetery in Buffalo NY. The elaborate monuments the entrepreneurs built for themselves, and also in a most bucolic setting for a city. Oh yes, I remember your Warsaw photos. They were very atmospheric to say the least. The rest of the lichens on earth live on the thousands of stone fences in New England … and any left over, live somewhere on our house. Green. Our house is green. We used to have an almost completely lichen backyard … it was wonderful underfoot, I should add. Sadly, the septic system needed redoing, so it got dug up and has not regrown. It was much nicer than grass and much GREENER too. I like graveyards too, the older the better. I love the old inscriptions. A lot of people around here like the graveyards. Drawings and photographs of the stones. Very popular. And there are always wonderful old trees there, too. Pollen – a great disrupter of the respiratory system. What I don’t understand is sometimes I react with a vengeance, and other times I don’t. But then remembering the magnified images of pollen grains from my prehistory classes, some did look like armoured missiles. Fascinating, as usual, and lovely photos. As kids we used to ride our bikes and go conkering in a graveyard at a Church in the small village of Doddleston, not too far from where we lived in Chester. I seem to recall Pete has some info on lichen and has done a few posts too. I haven’t visited Pete lately. Thanks for the hint. I do appreciate your frustration trying to decipher inscriptions. That’s happened to me too. I’ve had some success photographing them and then adjusting the contrast on the image, but some will forever remain a mystery to me. That’s a very good deciphering method, Su. it is an interesting project and last week I took a photo of some lichens – just on a tree trunk and rushed it – (sigh – sometimes breaks are needed and cannot get all the photos we want) – so coming here to the last photo of all the wonderful lichen life and texture – quite the treat. So pleased to bring you some lichen pix, Yvette. It’s a very pleasing angle, isn’t it. Obvious really, that graveyards can be sanctuaries in more ways than one. I shall visit them now with much greater attention. I love graveyards, too. It’s rather peaceful. Very nice post! A graveyard is a place for contemplation about life and death, ins’t it. Particularly for a photographer. I really like you special approach. Thank you, Otto. I do appreciate your comments. I had a chuckle picturing the vicar in his whirlwind of white cassock and your Pa happily and obsessively in his own silent world mowing the lawn. Another lovely peek into your childhood Tish. 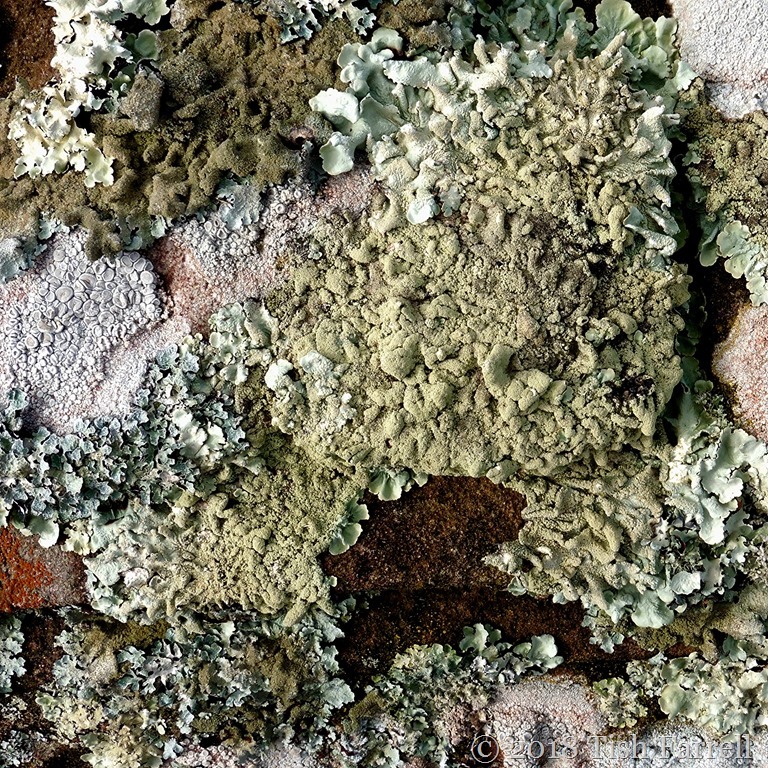 Interesting facts about lichen too accompanied by delightful square photos. As the first one scrolled up onto the screen it looked like a monster appearing. Lovely to make you chuckle, Pauline. 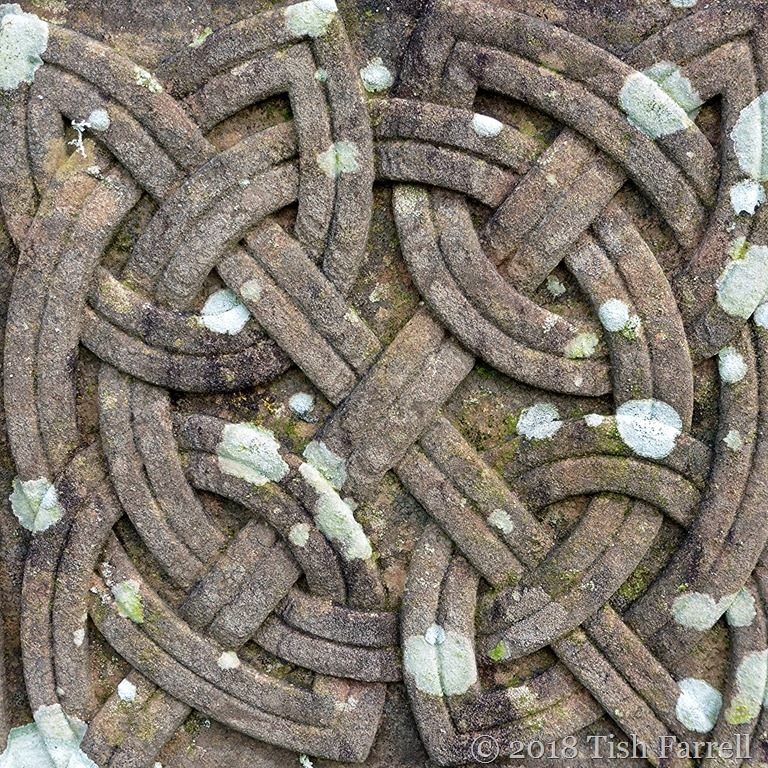 Those lichen covered stones definitely do loom in close up. Thanks for that bulletin, Janet. Must go to the library and find her. The story actually takes place in Ludlow. I like the story of your Pa. These photos work well in the square format – it draws attention to the detail. 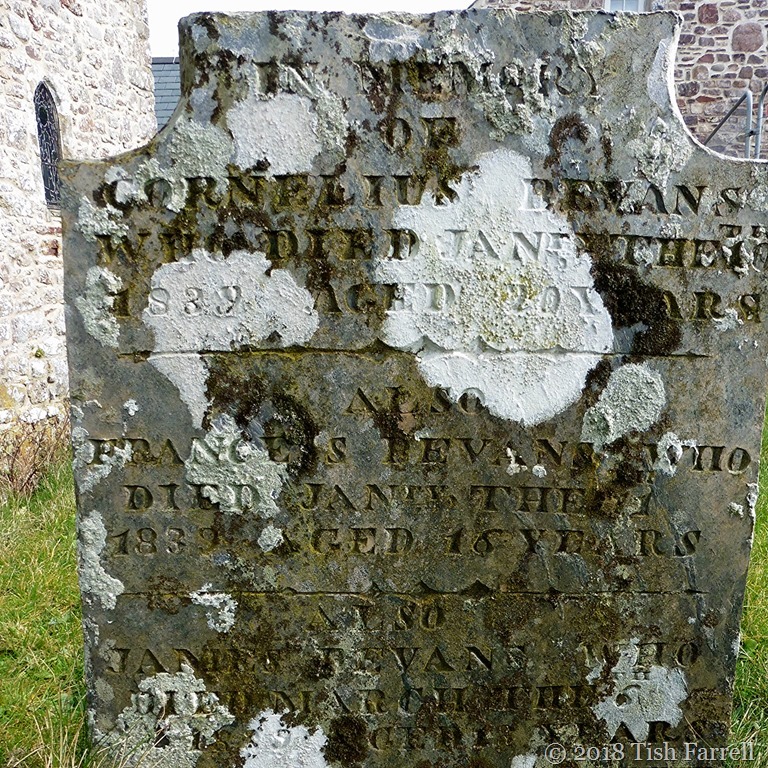 I like going round graveyards too and great to know they are a haven for lichen. So-oooo happy that you like these squaring of circles Becky. Thank you. Magnificent squares for Becky, and social and natural history too! A bumper crop, Tish 🙂 🙂 2,000 varieties! Who’d have thought? And I love the story of your Pa and the whirlwind vicar. 🙂 Have a wonderful weekend! Hope it warms up so you can get in that garden. Many thanks, Jo. Can only put it down to the invigorating Pembrokeshire air. As to the garden – I need to go and turn compost heaps before the Easter sleet. Have a good weekend. A fascinating read, Tish. I really enjoyed this visit to the graveyard in pictures, and learning something of its value to other life forms. I enjoy graveyards, as those here in New England have slate headstones which retain much of the original carvings. You’ve reminded me I have some photos of the graveyard in Salem. Must have a look at them. Fascinating story, Tish. I also like the quiet stories of the graveyards. Loved the natural art you had captured. Such wonderful textures in your images. I also love wandering around graveyards, especially in Europe. Rather than find them depressing, I see them as a place of loving memorial to the souls that once walked the Earth. That’s rather what I feel too. Scottish graveyards can be rather awe-striking, though possibly a combo of memorial and weather broodingness.